On the way in to my office yesterday, on Meguro Dori, a cyclist caught up with me from behind -- all too common an occurrence this year. It was Laurent on his new, beautiful Eddy Merckx machine fresh from its Belgian home! We rode together until our routes separated around san-no-hashi. 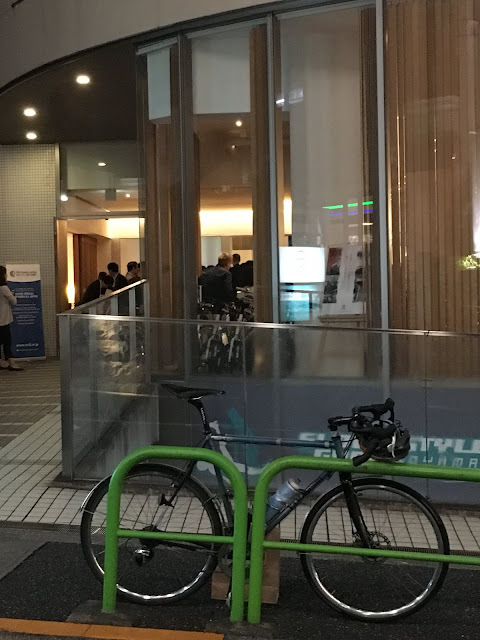 Laurent mentioned that he was going to the French chamber of commerce & industry event for the Tour de France Saitama Criterium, that evening. I jumped at the information and opportunity to join. I arrived a little after 8PM, only leaving the university after my class finished. The event was supposed to be from 630 to 900PM, so I was surprised to see that the "presentation" speeches were still in progress. I talked my way in, with the admission charge and mention of Laurent's name--too late to join the raffle. I went to the first of these events, back in 2013 with Jerome. In fact, I think a significant portion of the audience showed up that time because we posted it to TCC, this blog and elsewhere. But I am not on the French Chamber of Commerce and Industry in Japan's mailing list, so I would have missed this but for the serendipitous meeting with Laurent. The location this time was OVE Minami Aoyama, a Shimano-owned "life creation space". A nice space -- I would like to go back and see what it is like on a normal day, though it seems to be basically a cafe, only open 10AM to 6PM. Anyway, back in 2013, we enjoyed rubbing shoulders with Bernard Hinault, Romain Bardet, and Yukiya Arashiro. Jerome and I and families ended up dining with Arashiro and his significant other a month or so later. This time Yukiya was not there, but Hinault, Bardet, Adam Yates and others were. Romain Bardet has quickly moved up the ranks of Tour finishers, this year ending 2nd in the General Classification, and winning a difficult mountain stage late in the event. He is rare among pro-tour cyclists, a "fat adapter" rather than "carbo loader". In other words, he has trained his body to burn fat rather than relying upon carbs -- a hot topic on, among others, randonneuring message boards. 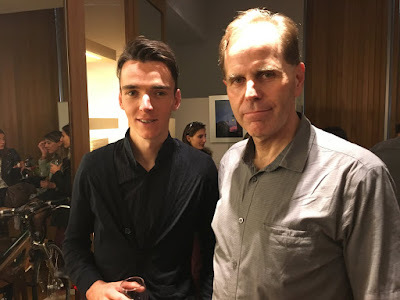 He has the best hope of any French cyclist in a long time for a victory in the GC at the Tour, and at age 26, he is just entering the "window" of 5-7 years when such things are most likely to happen. Of course, I parked my commuting bike out front of the event. I was a bit surprised that it was ONLY bicycle at the event. Yes, there were plenty of bikes inside (part of the store display, pushed to the side for the reception), but I was the only one to arrive or leave by bike. Maybe it was the fact that my commuting method forced me to forgo alcohol at the event?